Click here for Text Only. Q: What is a tetraploid? Is it a "double" flower? 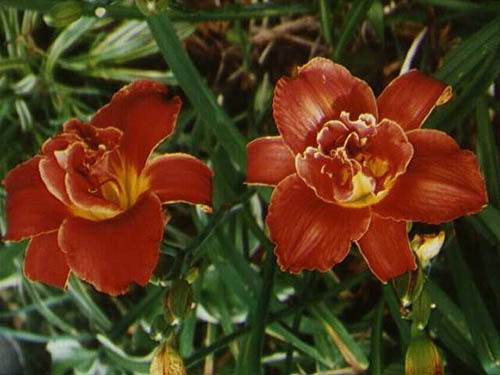 A: Tetraploid daylily plants have twice as many chromosomes as diploids. Being double has nothing to do with it. There are both tetraploids and diploid doubles. Q: What does "double" mean when used to describe Highland Lord, a tetraploid? A: Doubling is another form of the flower. Some look like two or three blooms are stacked up; others have extra petaloids in the center of the flower. 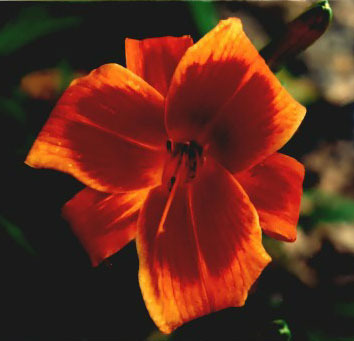 Some single blooms will occasionally have more than the 3 sepals and 3 petals. When this only occasionally happens, it is just a freak of nature -- not a double. Q: What does spidery mean when used with Ballet Russe, and how does this differ from the use of spider in Dark Star? Semi-spidery in Don's Wild Heather? I would guess that it has to deal with the width of the petals? 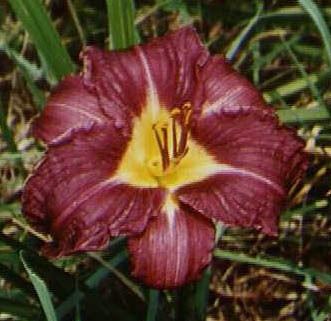 A: The Daylily Society recently came up with descriptions of spiders and so-called variants. Basically, a spider has segments that are five times as long as their width, or a 5/1 ratio. Anything that looks close can be termed "spidery" or "semi-spider," but not in the 5/1 ratio. Q: What do the terms "extended" and "dormant" mean when used to describe Eva? A: "Extended" means that the blooms last into the night, longer than the usual daily blooms. "Dormant" means that the foliage disappears after freezes in late fall. There are evergreens that remain green and growing in the southernmost part of the U.S.
Q: What does "repeats" mean in the Buttered Popcorn description? 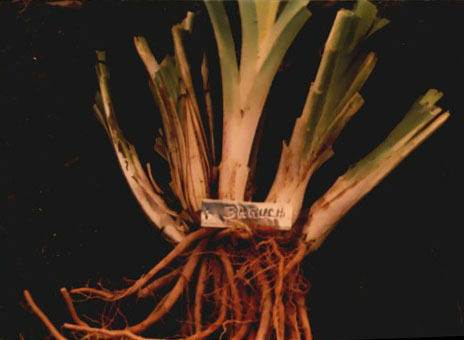 A: It means that after blooming once in the season, it sends up more scrapes (stems) for a session of reblooms. Q: Is there a difference in the use of eyezone and throat? A: Yes. The throat is the center part of the flower, usually a lighter color than the petals and sepals. The eyezone is usually a contrasting darker color in a band around the segments. If it covers both petals and sepals, it is an eyezone. If it only covers the petals (wider segments), it is usually called a band. It is an added plus that one of the world's most beautiful perennials is also one of the easiest to grow. Plant in full sun, if possible, in good soil, if possible, water during times of long dry spells, and enjoy them for months and years. Although the daylily's scientific name, Hemerocallis, means "beautiful for a day," the fact that most individual daylily blooms live up to this habit is more of a benefit than a fault. 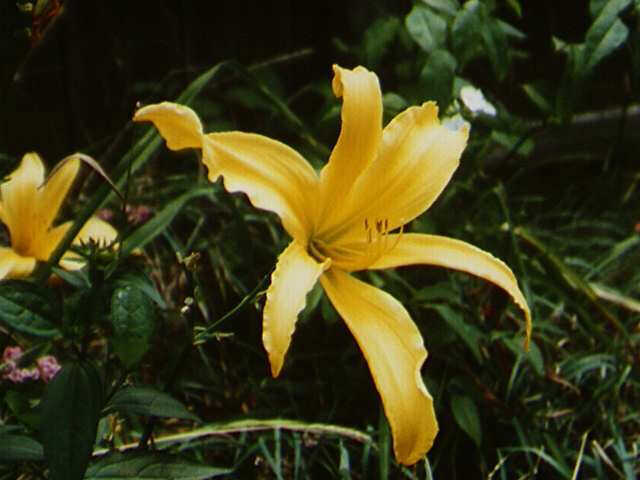 Storm injuries or unsightly effects due to insects or other causes persist on most garden plants for days but can be forgotten the next day with daylilies when a whole new set of fresh flowers opens to greet you. Best planting times in Virginia are spring and fall, and they may be moved from my garden to yours in full bloom when you can decide where each color will make the best showing in your garden. Though I start sales and shipping around the middle of April, if you are a local resident I recommend that you come and see them in full bloom in June and July. Descriptions do not give as good an indication of their true beauty as looking at the real thing in living color. The growing point of a daylily plant is the point at which roots and tops meet, and this crown section should be no deeper than 1" below the soil line. Mulching does many wonderful things for your garden, and I mulch when I have material for that purpose. I am constantly adding and digging out plants, so this is not always feasible for me. They are not fussy about type of soil, but extra dividends will result from adding compost, well-rotted manure, sand, or peatmoss to the planting site. Peatmoss is NOT a good mulch, as it tends to cake and cause moisture runoff, but it is a great lightener mixed in with the soil mix and acts like a sponge to latch onto moisture and have it available for the plant. Add a sprinkle of fertilizer, whatever you normally use, 5-10-10 or 5-10-5, when growth begins in early spring and then after bloom. You don't need to overdo it. Your soil may be fine as is. A: Tiny insects the size of the top of an exclamation point ! "Their rasping mouth parts do all the damage, lacerating the plant tissue at the segment edges of undeveloped buds, forming within the fans before the scape emerges." Q: What do they do to Daylilies? A: "They do their damage inside the buds before the buds open." The actually eat or scrape the color off the bloom and eat the juices that "ooze from the injured surfaces." The resulting blooms look speckled like rain/water damage. They also "rasp long narrow bands on the scape stem. Red & purple flowers seem to be favored, the pH of the sap a probable cause. Buds are sometimes so damaged that they look as if small zippers had been sewn into the edges of petal and sepal. Flowers are unable to open properly and are deformed and contorted. Scapes are sometimes so damaged that seed pods often dry and break off before the pod matures." Q: How do I control them? A: "The best remedy is remove old foliage in early spring, spraying with .05% mixture of diazonon alone or combined at the same strength with the systemic agent cygon. Repeat spraying may be necessary within a short time if the infestation is heavy, as the scape elongates and buds develop. Any other sucking insect will likely be destroyed as the expanding tissue continues to carry the systemic chemical." 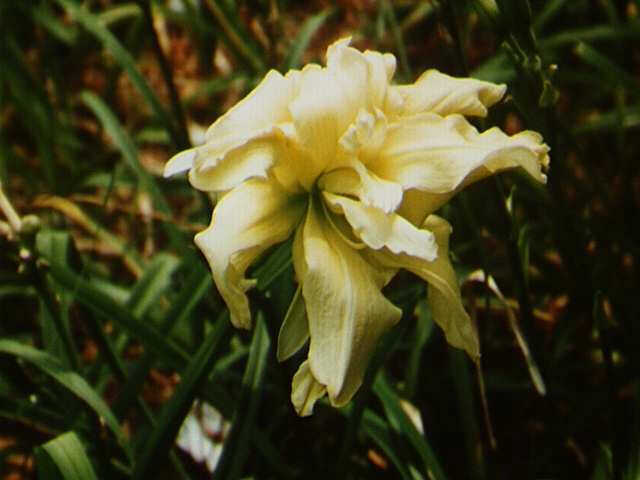 Quoted lines are from the article by Howard D. Brooks entitled, "Pests, Enemies and Friends of Daylily Growers" from the Spring 1989 Region 4 Newsletter, of the American Hemerocallis Society.